Jake Rosenbarger knows a thing or two about high-stakes competition: Before he and his wife opened Kim and Jake's Cakes in Boulder, Colo., Rosenbarger was a professional bicycle racer. But for a guy who honed his chops banging into opponents' handlebars at 35 mph, he has a surprisingly laissez-faire approach to competition in his new field. 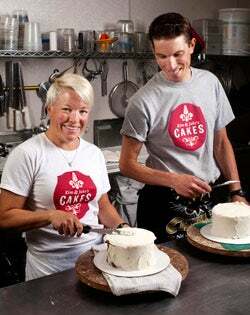 Plays well with others: Jake Rosenbarger of Kim and Jake's Cakes. "Every shop seems to have its own identity and appeals to a different customer," he says. "I don't feel like we're directly competing. We have a different style in the way we go about our business that makes head-to-head competition a little less of a factor." Like many business owners these days, Rosenbarger is guided by a refined, less aggressive perception of competition: less cutthroat, more introspective--even more cooperative. These entrepreneurs say they'd rather use their competitive drive not to crush would-be opponents but to focus on improving their own businesses. It's fair to say that one's approach to running a business is likely driven by one's understanding of the nature of competition. In the business world, competition is as variegated as human behavior. Are you cutthroat or cooperative? Quick to go for the kill or willing to bide your time? "We are reinforced in our behavior to be better than others and to eliminate our opponent as if we were in a competitive game," says Bob Vecchiotti, a Peterborough, N.H.–based business psychologist who has advised executives at companies such as Anheuser-Busch, Monsanto and Heinz. "That's where we are. That's where the culture is. And sometimes to get the cooperative side going takes a little more effort." Chris Jaeger got his cooperative side going when he and his twin brother, Robert, were launching Nashville, Tenn.-based RentStuff.com, an online clearinghouse for renting just about anything. (Jaeger calls it "eBay for rentals.") A former investment banker in New York, Jaeger got the idea for RentStuff when he had to endure considerable hassle to rent a mountain bike in Manhattan. Last summer RentStuff became one of six startups chosen for Jumpstart Foundry, a Nashville-based mentoring program. The budding entrepreneurs went through a grueling 14-week session in which they sharpened and tested their business models before presenting them to a roomful of 300 potential investors. For Jaeger, the process was both competitive and supportive. "It's a natural sort of race-to-the-top atmosphere," he says. "My overall feeling about competition is that because you work in the entrepreneurial field, there is a natural competitiveness that fuels all of us. But there's also a very strong sense of brotherhood among entrepreneurs. I want to see other young people in this pool succeed. It's something that binds us together as entrepreneurs." Today, with RentStuff up and running--and its recent expansion into Chicago, to the new 1871 space operated by the Chicagoland Entrepreneurial Center--Jaeger doesn't view other collaborative-consumption businesses as competitors, but as colleagues. These days, he says, he's competing mostly against prevailing consumer patterns, which generally don't include renting routine household stuff--lawn mowers, cameras, bikes--through a website. "As any one company gets traction, it means more and more people are getting this mindset," Jaeger says. Sean D'Souza believes more entrepreneurs should follow Jaeger's lead and try to learn from their competition. A native of Mumbai, India, now living in New Zealand, D'Souza, who calls himself "a marketing iconoclast," writes books and conducts workshops on marketing in the U.S. and Europe. His site, PsychoTactics.com, carries the slogan: "Why customers buy (and why they don't)." "I really think you should find out what your competition is doing and what they're doing better than you and what they're doing worse than you," he says. "If they're doing better, it makes you feel like you have to sharpen up your act. And if they're doing worse, it makes you feel better, at least for a day." D'Souza posits that most entrepreneurs are not willingly competitive. They only become so, he says, "when they're put in a position where if they lose, they're dead." He often tells entrepreneurs they'd be better off paying less attention to the competition and more to perfecting their own business practices. He calls it "playing emperor." "This is why Apple is creaming the hell out of the competition," D'Souza says. "They play emperor all the time. They're not even considering the competition. They're just building from nothing. Once they're in the marketplace, other people are going to compete with them." 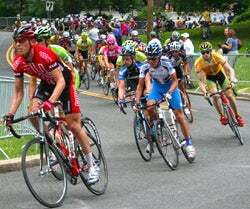 Just like competitors in a bike race, entrepreneurs have to step up when they see an opening on the business track. 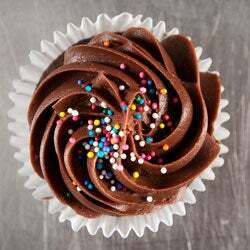 Rosenbarger knows--he and Kim opened their cake shop two years ago, figuring they'd focus on the retail end of the business. Then Whole Foods Market came calling, and the business plan shifted. Today the cakes are sold in six Boulder-area Whole Foods and at Alfalfa's, a local grocery. "We got lucky," Rosenbarger says. "We were going to go for restaurants and coffee shops and that kind of thing." Turning on a dime was something the former racer was accustomed to. But while his bike career endowed him with the work ethic and mental toughness necessary to succeed as a business owner, it did not prepare him for 11-hour workdays. Clearly, the new gig is no cakewalk. "This is a hard business to be in," he says. "It's physically very demanding. It would be great for any endurance athlete to work in a regular job for a couple of years. It's taught me a lot about how luxurious I had it."